Plus Nine Hours: Dazaifu, Fukuoka. Feeling that "I'm leaving Japan soon...ahhhgg!" pressure again, I decided to take a day trip to Dazaifu, about half an hour out of Tenjin, Fukuoka, by train. 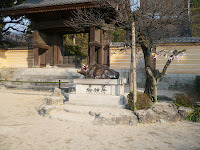 It's one of the country's most famous and treasured temple grounds as it contains a shrine and lots of historical sites. I got on the train and connected using another, and arrived in the little city. 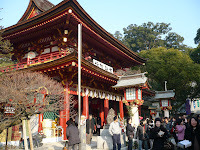 I was pleased by how busy it was, the first few days of New Year see millions of people across Japan going to shrines and saying a little blessing for the year ahead. 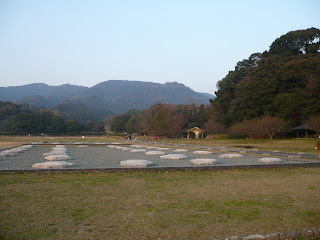 Dazaifu seems to be a good and very popular place to do it. When I arrived, I walked up a street full of shops and restaurants, selling hot Sakura (cherry blossom) tea and sweet bean paste cakes. 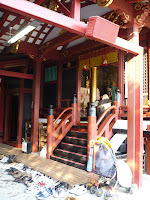 Then, at the top there was a shrine gate and a bridge, not far from the museum. 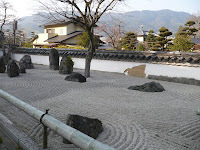 After seeing the shrine and the things clustered around the station area, I decided to walk on further through Dazaifu town and have a look at the other things on the map, such as an old Ordiantion hall where monks used to be recruited, and the actal ruins of the government office of Dazaifu. 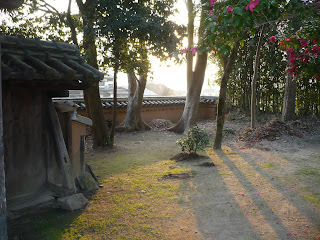 The old ordination hall had a shrine next to it, which looked great as the sun sank lower between the trees. A few metres down the road are the ruins of Dazaifu itself, the name given to the actual administration office of the whole of Kyushu. This must have been a really powerful seat with a lot of responsibility packed into one space, but all that remains now are some foundation stones, a museum displaying items found during excavations, and a beautiful park, in which families play football, hurl frisbees and walk their tiny, stupid dogs. The trees surrounding the park were a real sight after spending a year without much countryside, staring everyday out of accelerating train windows at tightly-packed beige coloured apartment blocks straddled by multitudes of thick overhead cables. However, it was getting dark by that point and there was a railway station by the Dazaifu ground, so I decided to come back before I leave and see it on my second visit. I went back to Tenjin, then Hakata on the subway, then Kokura on the Sonic, grabbing some Raamen on the way. Dazaifu is the place to go when the city gets too much, you're in need of a bit of reflection, or if you simply want to take some stunning photos and memories back home.